A visit to Marina Bay Sands always puts me in a dilemma. 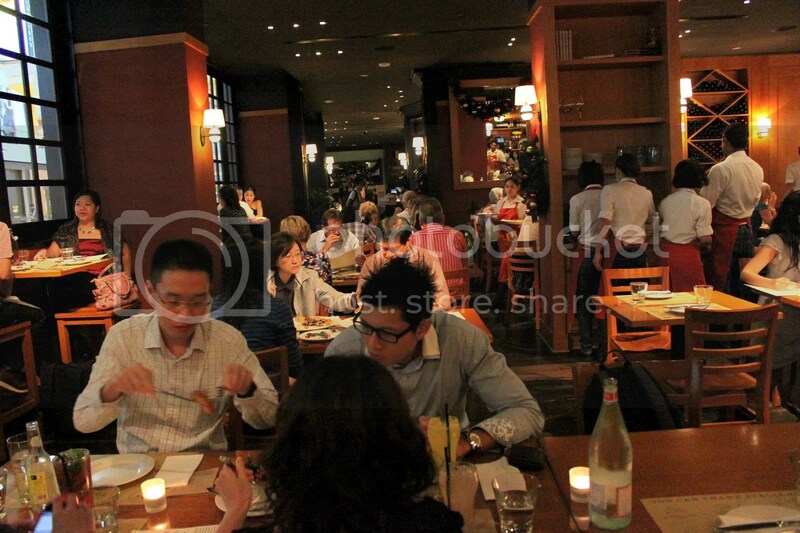 On one hand, a meal at the handful of celebrity and fine dining restaurants would surely bust my budget. On the other, paying over $10 for a food court meal isn’t an enticing option either. However, an optimal compromise would be Pizzeria Mozza, a reasonably priced Italian joint that has the backing of Mario Batali, who has appeared on Iron Chef America on multiple occasions. 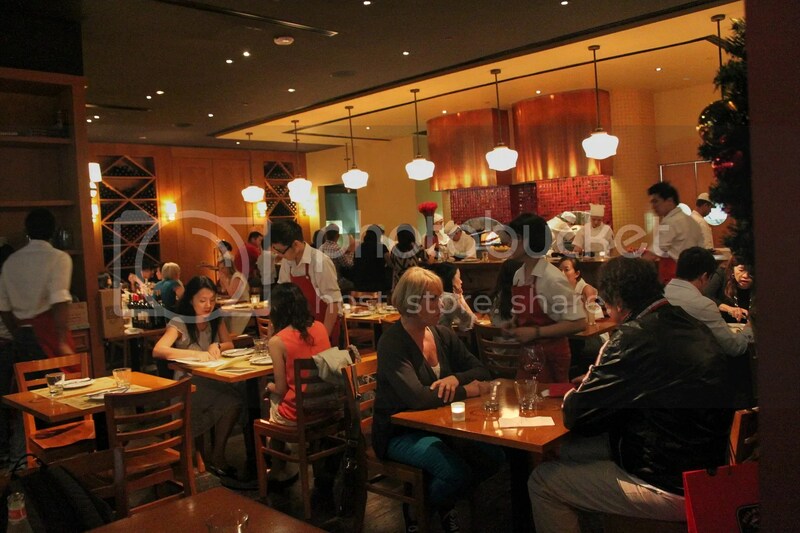 Despite being a Wednesday, the restaurant filled up quickly and without reservations, one can only be resigned to counter seats, that’s if you are even fortunate enough to get one. For a pre-theatre meal for 2 pax, a single portion of appetizer, main and dessert is just nice in my opinion, especially if you are thinking of getting a pizza as a main. 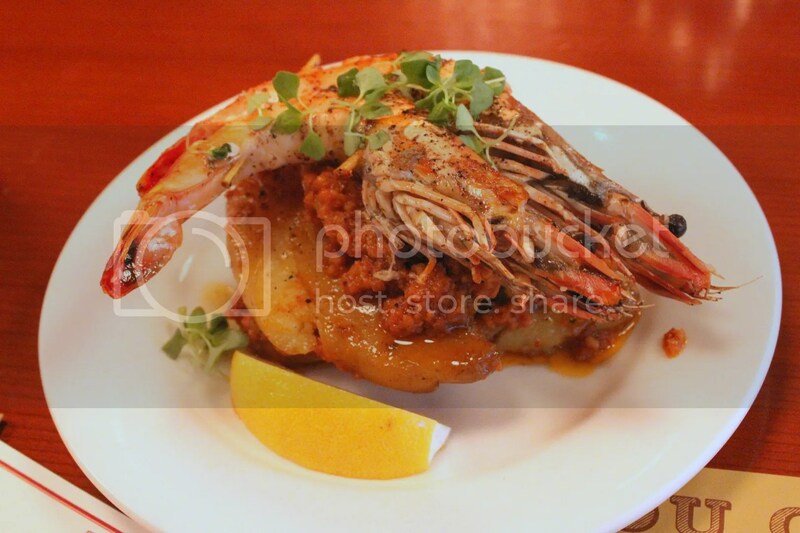 The Prawns Al Forno with Potato & Salsa Romesco ($19++) was a good choice for a starter, featuring 2 grilled prawns atop slices of roasted potatoes smeared with Salsa Romesco, which tasted very much like a meat based pasta sauce. 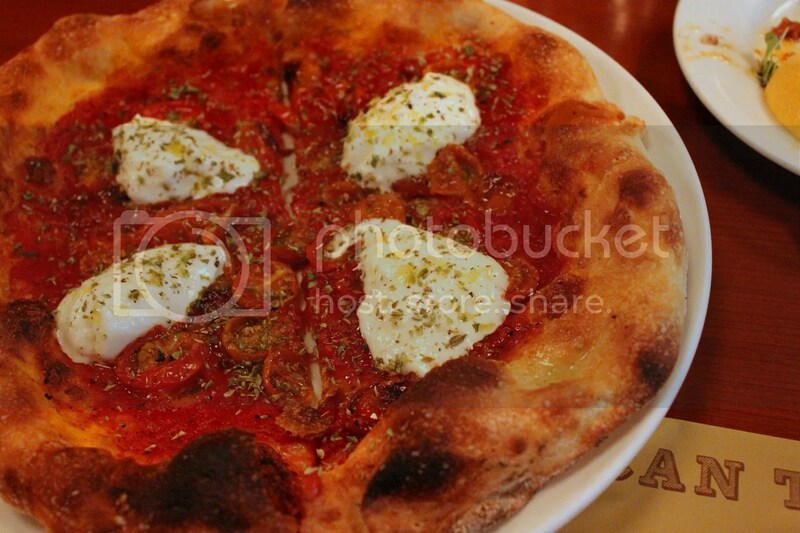 For our pizza main, we ordered the Burrata, Slow-roasted Tomato & Sicilian Oregano Pizza ($30++). The flavour of the tomatoes was pretty concentrated and the tang was a little overwhelming at first bite. After a while however, we quickly got accustomed to the strong flavours and also discovered the function of the burrata in neutralizing the tartness of the tomatoes. On the whole, I think it was a decent attempt, though I would have preferred a thinner outer crust. 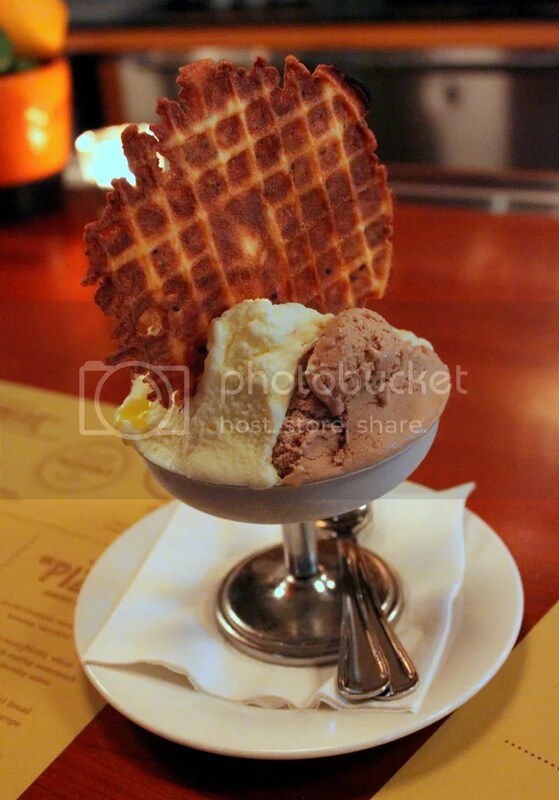 For desserts, we got a serving of Gelato – Chocolate Malt, Vanilla & Olive Oil ($17++). Nothing out of the norm for the chocolate malt and the vanilla but this was definitely a first for the olive oil and I know of no other places that serves it. The taste was rather interesting, a little on the savoury side especially with the light sprinkling of salt flakes which was easily detectable. 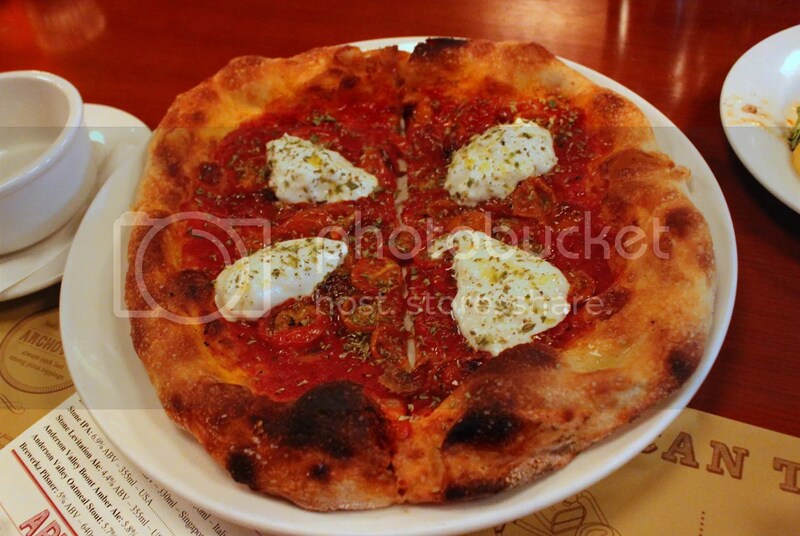 I wouldn’t go as far as to say that this is the best pizzeria in Singapore but based on the 2 meals I have had here, I would say that the quality of both the food and service is pretty consistent. 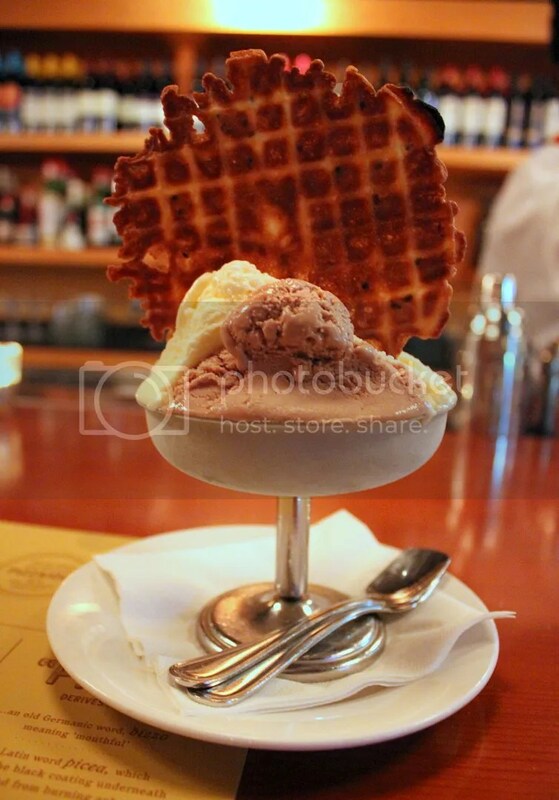 Categories : All YumYums in my TumTum, Cuisine Type YumYums, Italian, Location of YumYum, Marina Bay, Yummy!